Antonio P. Contreras, one of the most vocal critics of Vice-President Leni Robedo, received the pink slip from a radio station he's been working for during the last year or so. In a Facebook post, Contreras narrated that he heard the news when he went to his morning radio show, the offices of which are located at the Capitol Commons in Pasig City. Contreras hosts a morning show called Karambola for DWIZ 882. He hosts the show with Jojo Robles, Conrad Banal, and Jonathan Dela Cruz. In the same Facebook post, Contreras claimed that he was fired by DWIZ becaus of Robredo. 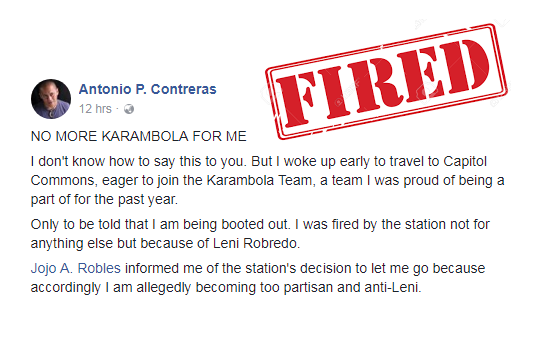 In the words of Contreras: "I was fired by the station not for anything else but because of Leni Robredo." "Jojo A. Robles informed me of the station's decision to let me go because accordingly I am allegedly becoming too partisan and anti-Leni," he added. "No more Karambola for me. I don't know how to say this to you. But I woke up early to travel to Capitol Commons, eager to join the Karambola Team, a team I was proud of being a part of for the past year. Only to be told that I am being booted out. I was fired by the station not for anything else but because of Leni Robredo. Jojo A. Robles informed me of the station's decision to let me go because accordingly I am allegedly becoming too partisan and anti-Leni. This is strange. I have been not as rabidly articulate about my dislike of Robredo for the good part of the year. In fact, I have been ignoring her. I rarely talk about her on the air or write about her in my columns.It looks like people acting on behalf of Robredo have somewhat pressured the station to fire me from the show. Leni Robredo, let me tell you this. You may have succeeded in having me fired from Karambola, but you have not won. You may have just reignited the fire in me to take you up and take you down. That is not a threat. That is a promise." "Leni Robredo, I am back! Isn't it ironic that you had me fired from Karambola when I was already ignoring you. Now, what you did was to make me once again train my guns on you. I have not said this for a long long time. You are human. You have a brain. But it looks like you do not use it." Antonio P. Contreras is also a columnist for the daily broadsheet The Manila Times and a professor at De La Salle University.